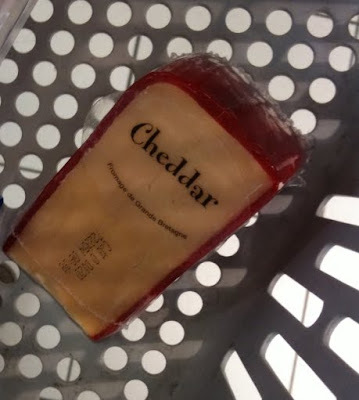 Lyon Eats: Found: Cheddar cheese! Spotted at Monoprix, right next to the fromage bleu and chèvre. It's 16.90€/kilo for a wedge of true Cheddar, made in Britain and loved by Americans. Have you spotted any American treats lately, send us the details! You can find Cheddar Cheese in "Galeries Lafayette" too (Metro Mermoz Pinel). You can find Cathedral City , which is English rather than American cheddar in some Carrefour supermarkets. Last lot I got was from Carrefour Macon. They also sometimes have unwrapped cheddar that they cut to order.